Monjur Rashid has been working as a freelance artist after earning his master of fine arts from University of Development Alternative (UODA). He started working with experimental mediums and after that he looked into working on mediums like bottles and umbrellas. He has received accolades from a number of organisations and has attended more than fifty group exhibitions in home and abroad. Monjur had his first solo exhibition at Alliance Française de Dhaka (AFD) in 2014 titled Searching Myself. 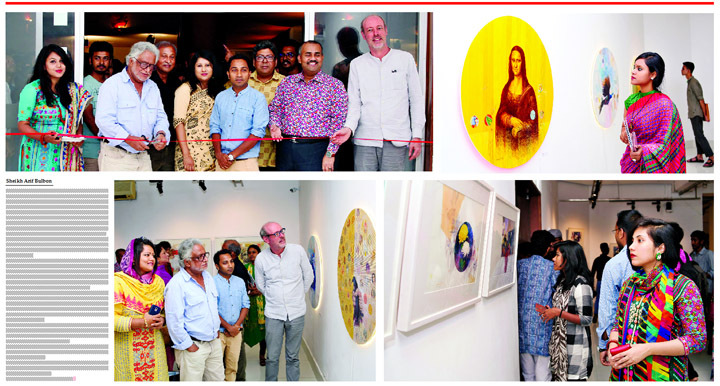 The painting exhibition titled Narrative of Time by artist Monjur Rashid is being held at La Galerie of AFD in the city’s Dhanmondi area now. The exhibition was inaugurated on June 26. Eminent artist Monirul Islam inaugurated the exhibition as the chief guest, while eminent photographer Nasir Ali Mamun, Prof Gazi M A Salam, founder and Managing Director, ISTT and Dr Rashid Amin, Associate Professor, Department of Fine Arts, Jagannath University also attended the opening ceremony as the special guests. Monjur is very partial to watercolour, acrylic and mixed media. And these mediums, to emerge from the canvasses as paintings, lend a helping hand in realising his feelings. His second solo painting exhibition titled Narrative of Time features a series of paintings demonstrating Rashid's command of portraiture. The artist uses geometry to narrate the story in the artworks that to be displayed in this exhibition. Most of the time he establishes a center character of the story than he weaves the canvas with surrounding elements. When he put graphical lines on his painting to make distance between the curators it becomes an irresistible power of the sensory world. In Mojur’s works, portraits are not always human faces sometime he chooses the theme of nature and presents it beautifully in his canvas.